Join us and take action to call for free movement for people, not weapons. 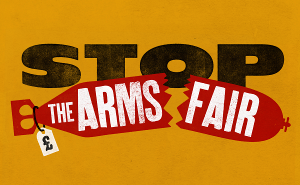 We will be sharing food, dance, cabaret performances, music and stories at the gates of the arms fair while an alternative “border force” take action to block weaponry and equipment from entering the fair. In September 2017 DSEI, one of the world’s biggest arms fairs, is coming to London. The weapons sold here fuel death, destruction and injustice perpetrated by militaries, police forces and at borders around the world. As militarised borders kill tens of thousands of people every year, the arms dealers and weapons companies seeking to profit from this inhumane treatment of migrants are being welcomed to London. We stand against those who seek to profit from these deadly borders and call for free movement for people- not weapons. Please join and share the Facebook event to help us spread the word! Come along on the day! Bring friends and food to share. Help with transport costs and accommodation is available and we will prioritise funding for migrants and people with low/no income. Please get in touch on freemovement(at)stopthearmsfair*org*uk to discuss this. We’ve got some great workshops and events lined up, as well as a craft space with screen printing, zine making, knitting and art activities running all day! 2pm: All African Women’s Group will be performing “We are Here Because You Were There”- a play that takes you through the asylum process, the discrimination and difficulties women often face from when they arrive in the UK and claim asylum, including detention, how they are treated by Home Officials, their lawyer and Immigration Judges . . . plus how self-help as part of the movement for justice spearheaded by asylum seekers, helps us overcome this and win happy endings!